Importing feeds into your website can be very useful in providing daily fresh content to your users. You can thus display an RSS news digest from all the main blogs/sites in your sector all on one page in your website. 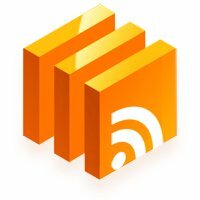 I have just released a new plugin called WP RSS Aggregator, with which you can very easily display an aggregator on a page or post in your website. 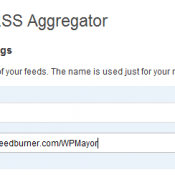 We are using this plugin here on WPMayor, head over to the WordPress World News section to see it in action. 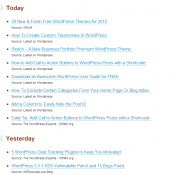 WP RSS Aggregator works in a similar fashion to RSS readers like for example Netvibes. You can add any number of feeds through an administration panel, the plugin will then pull all the feeds from these sites, merge them and sort them by date. The plugin uses SimplePie for the feed operations. The actual news feeds are not stored in your databases but only cached for faster response times. You can call the function from within the theme or even use a shortcode with parameters. Do you have any feedback or suggestions for this plugin? I’d love to know of any improvements that can be done to make it more useful for you. Great Plugin ! I was searching for a plugin to display a RSS Diggest on my website. As for your second functionality suggestion, I think in order to edit the title of each post the plugin would have to save the titles into the database, something which it doesn’t do at the moment, as I wanted it to always generate everything on the fly. FeedBurner does something like that as it creates posts from the feeds. Is this what you meant? Thanks for that, suggestions are on the Todo list. may I display only today’s (current day posts) together with date and time? At the moment no, adding it as a request for the next version. Great, looking forward new version! How to removed source and website tittle every link. At the moment this is not possible without modifying the plugin’s code directly, I’ll add it to the list of updates to be done in the next version though, thanks for the feedback. Is it possible to show more of the article content? Perhaps the first 100 words or more, so the blog doesn’t look like a bunch of links. It could give the reader reason to linger before leaving. This looks really good otherwise. Thanks. It is possible and will take not of your request for the next round of updates. Thanks! nice! how about adding custom favicon per feed? I’ll keep it in mind for the next update thanks! I cannot fix this issue – when I click on a link that is displayed the screen darkens, a whitebox appears in the middle and an orange circle displays, as though it is waiting for something. But the link never gets anywhere. There is a page there as if I click to see it in another window it appears. Is there a way round this? Is there a way to just click and go to the page in another window instead of the whitebox/darkened screen system? Just wanted to say thanks for a great plugin, it does exactly what I need. Do you know how often it pulls from feeds? You’re welcome Leonel, it pulls every hour. I just noticed that it put most of today’s feeds under “Yesterday”. This just happened a little while ago. Do you know why it would do that? Might be due to different time zones. I think it would be better if we could define the frequency of pulling the content? Maybe have an option such as every hour, every 6 hours… Do you think this is possible with manual way? Interested to use this plugin, however it would be better if it doesn’t pull every 1 hour. I will work on incorporating this in the next update. I may not know best about this aggregate thingy. Will pulling the content frequently generates a lot of bandwidth from our webhosting? Haven’t had that problem till now Dennis. If you encounter any such problems please do let me know so I’ll look into it. Here’s my case: I suspect the font size of those links should be based on my wordpress theme CSS. I increase the font size of the Post Titles but the “source” font size increase as well. Is there anyway to reduce the font size of the “sources”? 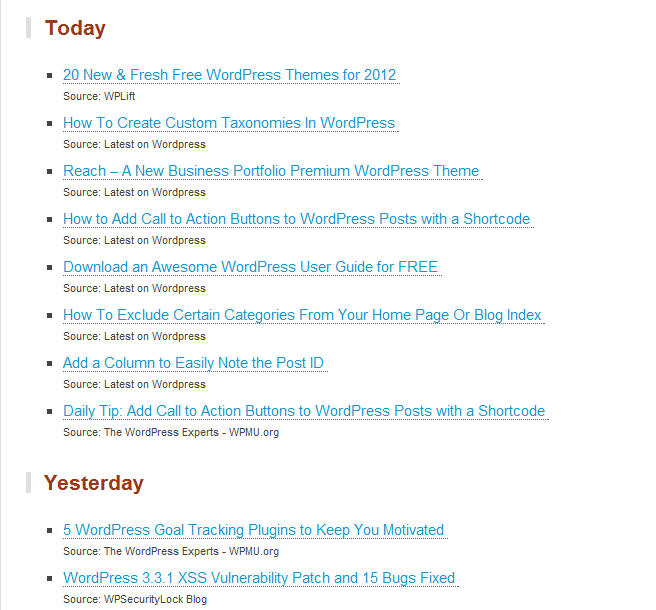 Thanks for wp-rss-aggregator, it’s very usefull. How to set open RSS link auto open in new tab/windows without iframe? Coming in the next version, thanks. Read those comments and I am keen on next release. Any estimated date? Thanks! – Eva. Hi Eva, I’m targeting and end of April release. How are you adding bullets next to each feed item? Thank you! That’s from the theme itself, you should be able to modify your theme’s CSS. Will this work as an aggregator to create a new feed from 2 feeds? Can the created feed be used as a feed for use with hootsuite or similar sites that post to other sites based on a feed?